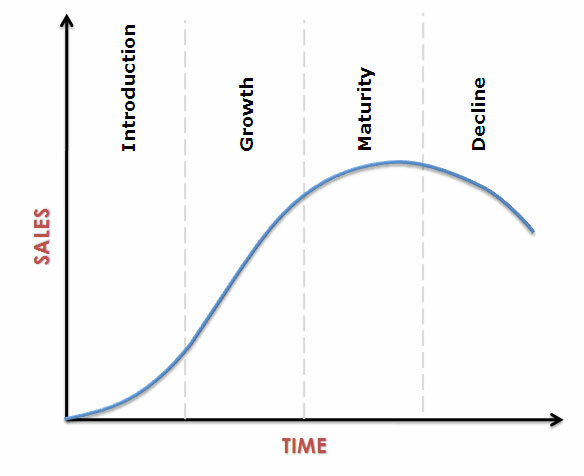 A new product passes through set of stages known as product life cycle. Product life cycle applies to both brand and category of products. Its time period vary from product to product. Modern product life cycles are becoming shorter and shorter as products in mature stages are being renewed by market segmentation and product differentiation. Companies always attempt to maximize the profit and revenues over the entire life cycle of a product. In order to achieving the desired level of profit, the introduction of the new product at the proper time is crucial. If new product is appealing to consumer and no stiff competition is out there, company can charge high prices and earn high profits. Product is introduced in the market with intention to build a clear identity and heavy promotion is done for maximum awareness. Before actual offering of the product to customers, product passes through product development, involves prototype and market tests. Companies incur more costs in this phase and also bear additional cost for distribution. On the other hand, there are a few customers at this stage, means low sales volume. So, during introductory stage company’s profits shows a negative figure because of huge cost but low sales volume. Branding, Quality level and intellectual property and protections are obtained to stimulate consumers for the entire product category. Product is under more consideration, as first impression is the last impression. High(skim) pricing is used for making high profits with intention to cover initial cost in a short period and low pricing is used to penetrate and gain the market share. company choice of pricing strategy depends on their goals. Distribution at this stage is usually selective and scattered. At introductory stage, promotion is done with intention to build brand awareness. Samples/trials are provided that is fruitful in attracting early adopters and potential customers. Promotional programs are more essential in this phase. It is as much important as to produce the product because it positions the product. In this stage, company’s sales and profits starts increasing and competition also begin to increase. The product becomes well recognized at this stage and some of the buyers repeat the purchase patterns. During this stage, firms focus on brand preference and gaining market share. It is market acceptance stage. But due to competition, company invest more in advertisement to convince customers so profits may decline near the end of growth stage. Along with maintaining the existing quality, new features and improvements in product quality may be done. All this is done to compete and maintain the market share. Price is maintained or may increase as company gets high demand at low competition or it may be reduced to grasp more customers. Distribution becomes more significant with the increase demand and acceptability of product. More channels are added for intensive distribution in order to meet increasing demand. On the other hand resellers start getting interested in the product, so trade discounts are also minimal. At growth stage, promotion is increased. When acceptability of product increases, more efforts are made for brand preference and loyalty. At maturity stage, brand awareness is strong so sale continues to grow but at a declining rate as compared to past. At this stage, there are more competitors with the same products. So, companies defend the market share and extending product life cycle, rather than making the profits, By offering sales promotions to encourage retailer to give more shelf space to the product than that of competitors. At this stage usually loyal customers make purchases. At maturity stage, companies add features and modify the product in order to compete in market and differentiate the product from competition. At this stage, it is best way to get dominance over competitors and increase market share. Because of intense competition, at maturity stage, price is reduced in order to compete. It attracts the price conscious segment and retain the customers. New channels are added to face intense competition and incentives are offered to retailers to get shelf preference over competitors. Promotion is done in order to create product differentiation and loyalty. Incentives are also offered to attract more customers. Decline in sales, change in trends and unfavorable economic conditions explains decline stage. At this stage market becomes saturated so sales declines. It may also be due technical obsolescence or customer taste has been changed. Maintain the product, Reduce cost and finding new uses of product. Harvest the product by reducing marketing cost and continue offering the product to loyal niche until zero profit. Discontinue the product when there’s no profit or a successor is available. Selling out to competitors who want to keep the product. At declining stage, marketing mix decisions depends on company’s strategy. For example, if company want to harvest, the product will remain same and price will be reduced. In case of liquidation, supply will be reduced dramatically. Product life cycle is criticized that it has no empirical support and it is not fruitful in special cases. Different products have different properties so their life cycle also vary. It shows that product life cycle is not best tool to predict the sales. Sometimes managerial decisions affect the life of products in this case Product Life Cycle is not playing any role. product life cycle is very fruitful for larger firms and corporations but it is not hundred percent accurate tool to predict the life cycle and sales of products in all the situations. The other question that am wanna understand is any other tools than a PLC that is used to plan and monitor a product progress in the market? I like the way the answer is given.thanks for helping. Very very thnx 4 giving valuable information.. I think the analysis should be with a specific objective for better understanding not always dependent or in two ways. Thanks for some informatioN. .it helps me a lot. . This is reality and up to date. keep it up guyz. Am a young marketer who need this information in deed. thanks a lot. Heya i am for the primary time here. I found this board and I to find It truly useful & it helped me out much. I’m hoping to offer something back and aid others like you helped me. Its like you read my thoughts! You appear to understand so much about this, like you wrote the e book in it or something. I think that you simply could do with some % to pressure the message house a little bit, but instead of that, that is magnificent blog. An excellent read. I will certainly be back. it helps my exam . is product life cycle universally accepted? yes product life cycle is accepted in real life with some changes in existing product with new product design at its maturity stage.